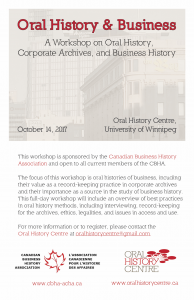 The CBHA/ACHA is pleased to sponsor a workshop with the Oral History Centre, University of Winnipeg, on the subject of Oral History, Corporate Archives, and Business History. This one-day workshop will be held at the University of Winnipeg in Manitoba on October 14, 2017. This workshop can be combined with visits to several important historical archives and museums in the city of Winnipeg. The CBHA/ACHA is pleased to provide its members with travel grants of up to $500 to attend workshops and conferences such as this. If you would like to apply for a grant, please log in to the CBHA/ACHA website and obtain the application form under the tab 'Membership'. 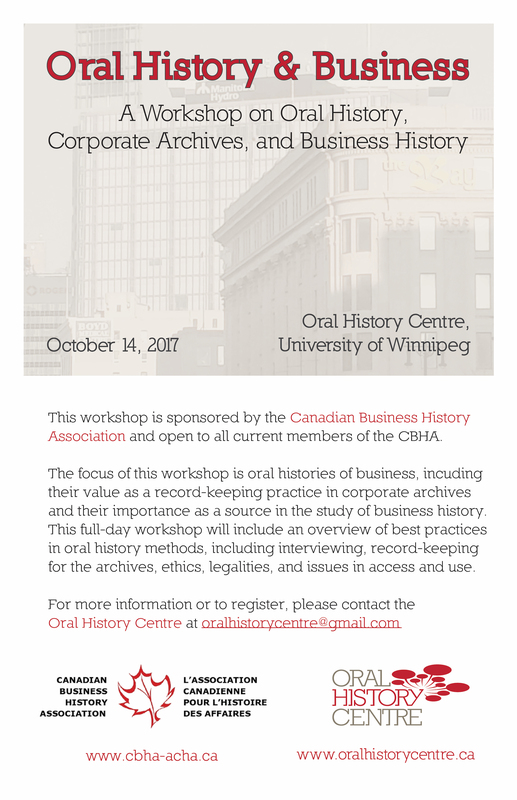 For further information on the conference, please contact Kimberly Moore of the Oral History Center at ki.moore@uwinnipeg.ca or 204-258-3090.